New concept buckle of innovative design. Different finishing in male and female. Available in various sizes. 40mm size is tested ISO 12402-7 for life jackets. New high resistance buckle, developped for technical uses. Tested ISO 12402-7 for life jackets. 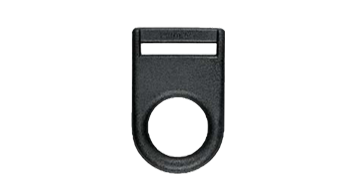 This rounded design buckle is used in various sectors. Tested 10.000 opening/closing cycles to guarantte a higher resistance in time. Possible customization with logo. Classic and timeless buckle, practical, safe and easy to use, it is used in various sectors. Tested 10.000 opening/closing cycles to guarantee a better resistance in time. Possible customization with logo. Historical buckle with square design, practical, safe and easy to use, it is used in various sectors. Tested 10.000 opening/closing cycles to guarantee a better resistance in time. Possible customization with logo. Light and slim buckle, generally used in medical sector. Double regulation buckle, to be used mainly on belts to facilitate regulation and avoid any use of other accessories. Tested 10.000 opening/closing cycles to guarantee a better resistance in time. Possible customization with logo. 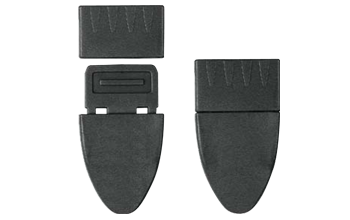 Classic buckles, it is used in various sectors. Tested 10.000 opening/closing cycles to guarantee a better resistance in time. Possible customization with logo. 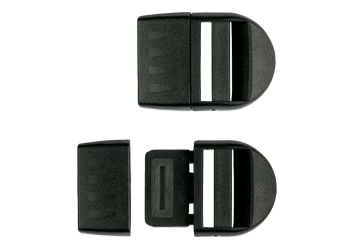 Strong buckle with side opening, it is used mainly in technical and sport fields. Possible customization with logo. Buckle with back plate, that can be attached directly on the fabric, without need to add more webbing. Mainly used in military applications. It is possible to supply also the punch for the back plate application. Buckle with a shape that allows to hide the webbing entry; it is used in various sectors. Tested 10.000 opening/closing cycles to guarantte a higher resistance in time. Possible customization with logo. Buckle with a shape that allows to hide the webbing entry; it is used in various sectors. It has a 3 bars passage, that allows a higher strain. Tested 10.000 opening/closing cycles to guarantte a higher resistance in time. Possible customization with logo. 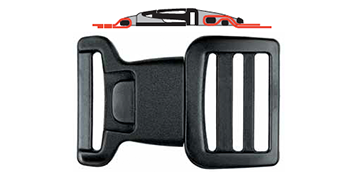 Light and easy to use buckle, it has a 3 bars passage to allows a higher strain and an easier regulation. It is used mainly in sport cloathing. Buckle with central button. It is suitable for luggages, folders and back-backs. Central relase buckle, it is made of 2 pieces, that fit one in the other. It has a double regulation on both sides. Central relase buckle, it is made of 2 pieces, that fit one in the other. Techincal buckle of high resistance, used in workwear. It is tested 10.000 opening/closing cycles to guarantee a better resistance in time. Cam buckle mainly used on back packs and belts. Satefy buckle with central button, it can be opened only using 2 hands. Mainly used in Infancy sector, on request it is possible to make the button Red. Possible customization with logo. Satefy buckle with central button, it can be opened only using 2 hands. Mainly used in Infancy sector, on request it is possible to make the button Red. Possible customization with logo. It has a 3 bars passage to allow a beter strain. Safety buckle with central button, it can be opened only with 2 hands. Mainly used in military fiels and in workwear; it is applicable on belts, together with a loop. Tested 10.000 opening/closing cycles to guarantee a better resistance in time. Mainly used in military fiels and in workwear; it is applicable on belts. it has a double regulation passage on both sides. Tested 10.000 opening/closing cycles to guarantee a better resistance in time. Mainly used in military fiels and in workwear; it is applicable on belts. It has a double regulation passage. Tested 10.000 opening/closing cycles to guarantee a better resistance in time. 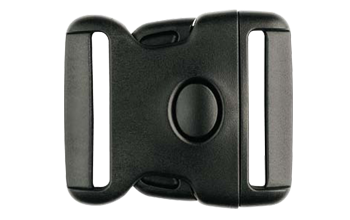 Swivel buckle with modern design, allows a high movement freedom. Mainly used in medical and military fields. Interlocking closure that allows a high movement freedom. Mainly used in medical and protection fields. 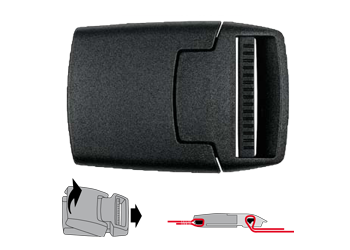 Standard side relase buckle, but very slim and light. To be used for belts and leather. 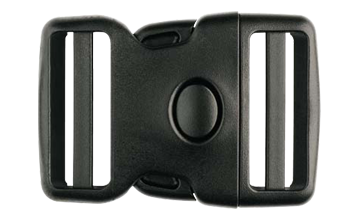 Cam buckle that allows an easy and fast belt regulation. It has a modern and slim design that permits to be used also in fashion areas. 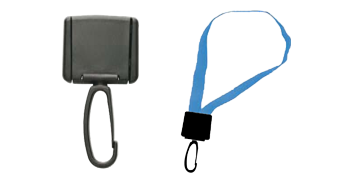 Low load buckle, it is used for neck lanyard, it can be opened in case of need. Side relaese item, it links the mobile phone with a webbing; it has also a small cord to attach the item directly on the device. Badge holder with swivel snaphook to be applied on webbing. It is not sewed, but blocked with a special system, more easy and convenient. 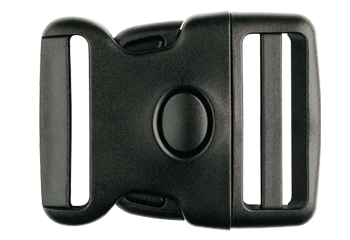 Cam buckle that allows an easy and fast belt regulation. Suitable for back packs. Ladderlock that permit to adjust the webbings of back packs shoulderpads. It has a high breaking strenght, to be used in technical and military fields. Ladderlock that permit to adjust the webbings of back packs shoulderpads. It has a high breaking strenght, to be used in technical and military fields. It has also a hole in which insert a cord to make the regulation easier. Classical Ladderlock, it adjusts the webbing on shoulderpads. Ladderlock, it adjusts the webbing on shoulderpads. It has also a hole that permit to insert a cord for an easier adjust. Ladderlock to be sewed directly on the webbing, it has a loop to cover the seam for a better aesthetic aspect. New ladderlock, it has a special shape to allow an easier release. It is mainly used on back packs and gloves. New design slider, to be used mainly on technical and military areas, it allows to regulate the webbing on bags and back packs. Small slider of easy design, it is used to adjust webbings. Easy and light slider, it is available in many sizes, it is used on bags, mainly in combination with buckles. Easy slider, it is available in many sizes, it is used on bags, mainly in combination with buckles. Double function item, it can be used as a loop and as a slider. It is used on back packs to allow an easier regulation of belts. 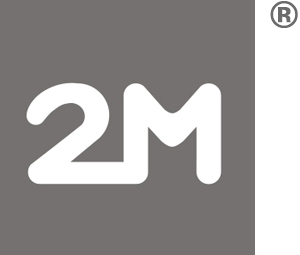 Is available in 2 different sisez. Strap puller that allows to adjust webbings, simply pulling them; it has a hole to insert the finger. Usually is used in combination with a ladderlock. 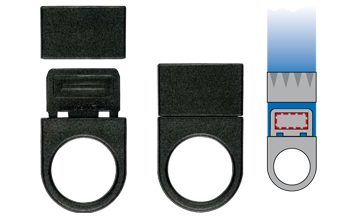 Strap puller that allows to adjust webbings, simply pulling them; it has a hole to insert the finger. Usually is used in combination with a ladderlock. It is sewed directly on the webbing and it has a loop to cover the seam. Strap puller that allows to adjust webbings, simply pulling them. Usually is used in combination with a ladderlock. It is sewed directly on the webbing and it has a loop to cover the seam.